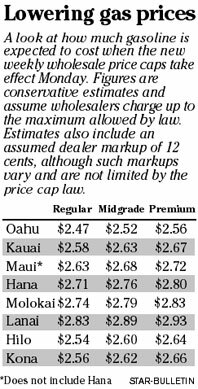 WHILE THE state's price cap on wholesale gasoline is set for another reduction for a sixth straight week, two participants in Hawaii's gasoline market have been given more time to submit proposals on adjusting the price cap formula. The price caps for next week, published yesterday by the state Public Utilities Commission, were set 8 cents lower than current price ceilings. That means that by Monday the maximum price at which wholesale gas can be sold will have fallen 88 cents since Oct. 17. If wholesalers charge up to the maximum allowed, the lowest price for regular unleaded is projected to be at $2.47 a gallon after taxes on Oahu. The highest price would be on Lanai, at $2.83 a gallon. Estimates assume a dealer markup of 12 cents, although such charges vary from station to station and are not governed by the price cap. The statewide average could dip to about $2.63, more than $1 below the record price of $3.68 reached on Sept. 18, according to AAA's Fuel Gauge Report. Meanwhile, the state average continues to lead the country. Yesterday's statewide average of $2.77 a gallon was 11 cents higher than runner-up Alaska and 49 cents above the national average, AAA said. The auto club bases its survey on credit transactions from the previous day at more than 85,000 stations nationwide, including 222 in Hawaii. Opponents say Hawaii's prices are higher than elsewhere because the cap artificially ties the state's prices to three mainland markets that otherwise would have no effect on the islands. Supporters say Hawaii's prices have always been higher than elsewhere and that the law is working as intended by forcing island prices to track more closely to mainland trends. Meanwhile, two participants in the state's gasoline market have asked for and received more time to file proposals to adjust the cap. The PUC solicited proposals last month from Chevron, Tesoro, Shell Oil, the Hawaii Petroleum Marketers Association and the state Consumer Advocate on suggestions for adjusting the price cap formula. Specifically, the PUC is seeking proposals for creating different profit margins at various steps in the gasoline supply chain, a concern that has been raised by legislative Democrats who have criticized the PUC's implementation of the price cap law. The commission also is seeking proposals on how the law should address upcoming ethanol blending requirements for gasoline. Industry parties faced a Nov. 1 deadline to submit proposals, but the PUC granted a one-month extension to Shell and the HPMA after both said they needed more time to analyze the effect the price cap law has had on their operations. The PUC approved the extension in a letter to the industry parties earlier this month. Lisa Kikuta, chief researcher at the PUC, said there was no time line for analyzing proposals and making recommendations.